Lacy Garbar, clarinetist, is a freelance performer and private studio teacher in the Chicago area. She earned a Bachelor of Music degree in Clarinet Performance and Music Theory/Composition from Southern Illinois University Edwardsville, a Master of Music degree in Clarinet Performance from Northwestern University, and a Performer’s Certificate from Northern Illinois University. While at NIU, Ms. Garbar was the premiere winner of the annual concerto competition playing the Copland Clarinet Concerto. 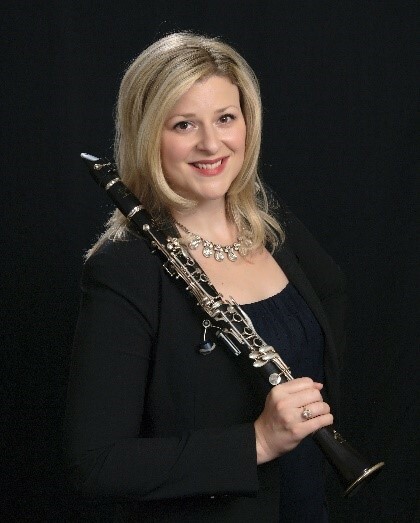 Ms. Garbar plays 2nd and bass clarinet with the New Philharmonic, and has performed with various Chicagoland ensembles including the Illinois Philharmonic Orchestra, Northwest Indiana Symphony Orchestra, South Bend Symphony Orchestra, Peoria Symphony Orchestra, Chamber Opera Chicago, and the Elmhurst Symphony. Ms. Garbar has been clarinet instructor at Neuqua Valley High School since 2003, Naperville Central High School since 2016, and Waubonsie Valley and Downers Grove North High Schools since 2018. She has served on the faculty of Harper College and Wheaton College’s Community School of the Arts, in addition to having taught privately at other local high schools. She has also taught the clarinet studio at Northern Illinois University twice as a sabbatical replacement. Ms. Garbar’s high school students have enjoyed many successes - including many having made both IMEA District and All-State festivals, several who have been in the CYSO and Elgin Youth Symphony orchestras, and countless others who have gone on to earn college performance scholarships. When not performing or teaching, this St. Louis native thoroughly enjoys her adopted hometown of Naperville with her husband and two young children, and continues on her lifelong journey of learning the Russian language.